When I told you all about that huge German feast we held recently (Sausagefest 2017! 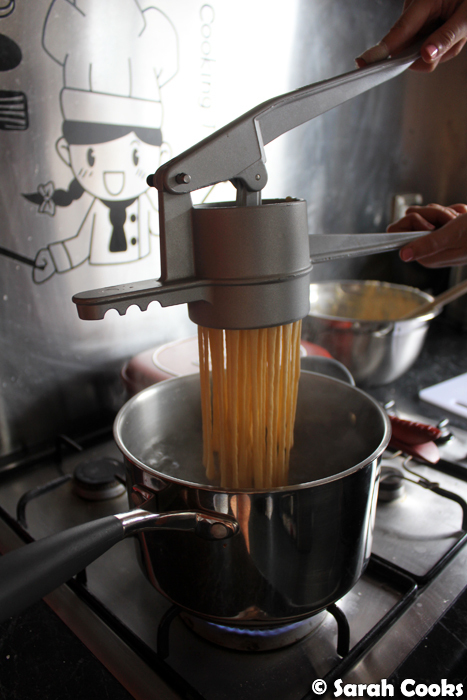 ), I purposely didn't say much about our carb side, that delicious vat of cheesy pasta known as Käsespätzle. And that's because I wanted to give it its own post! Spätzle ("little sparrows") is a short egg pasta that's found widely throughout Germany and German-speaking countries. I love it so much! Sandra makes Spätzle from scratch reasonably often, and when eaten plain, it's great as an accompaniment to rich stews or anything with sauce. (I say plain, I mean "doused in butter and chopped chives"). 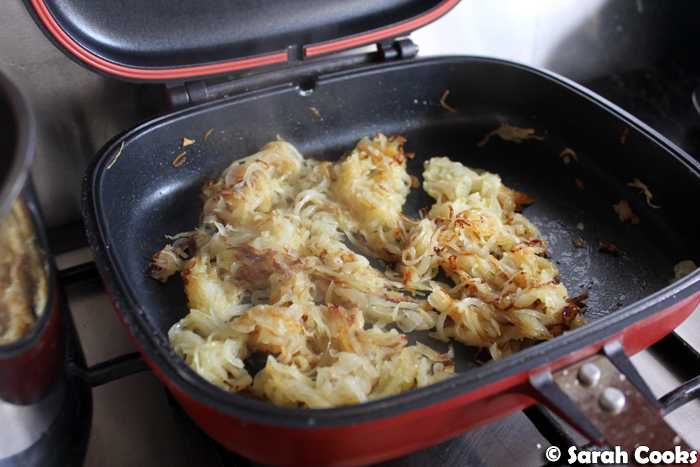 When mixed with cheese and topped with sautéed onions, it becomes Käsespätzle, or "cheese Spätzle". Super delicious! You could eat it as a side dish, or as a hearty vegetarian meal in itself. And given the cold, wet weather that we've suddenly gotten in Melbourne, I could really do with a big bowl of this for dinner! So, let's look at the Spätzle. 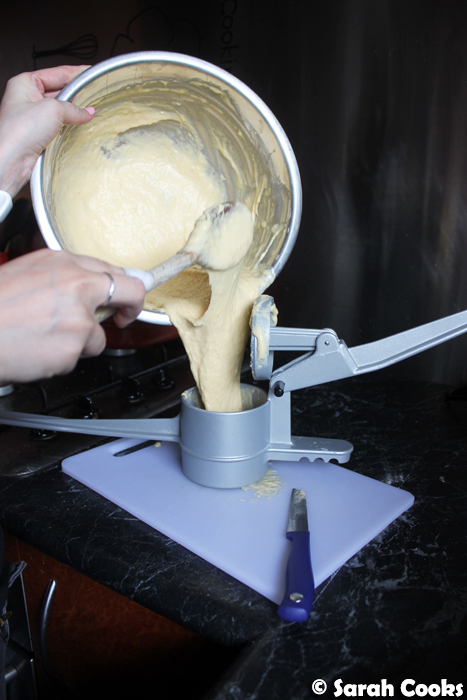 It's a simple dough of egg, flour and water. ...and then press it directly into salted boiling water. 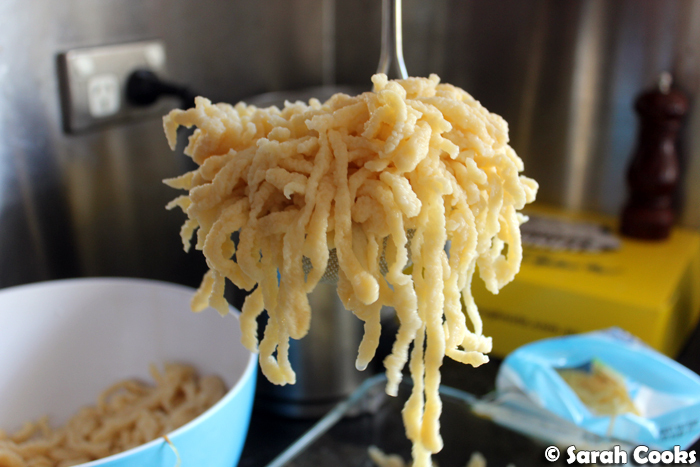 Once they float to the top, the Spätzle are cooked! (It only takes a minute or so). Fish them out, refresh in cold water to arrest the cooking, and they're done! So like I said, if you just wanted plain Spätzle, you'd drain these now and eat them as a side with whatever dish you like! 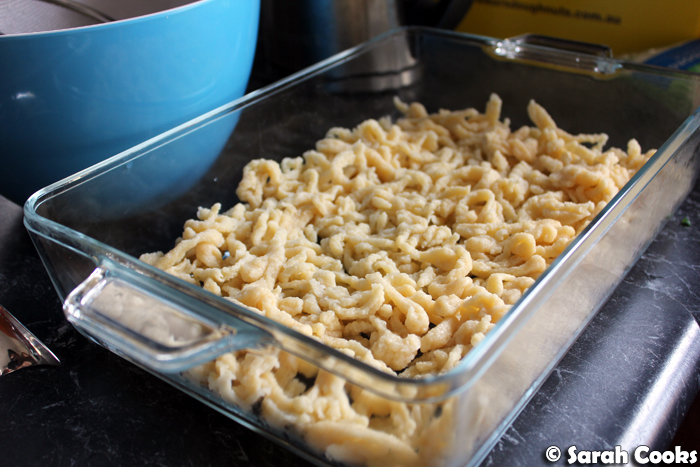 If you're turning them into Käsespätzle, however, there are a few more steps. 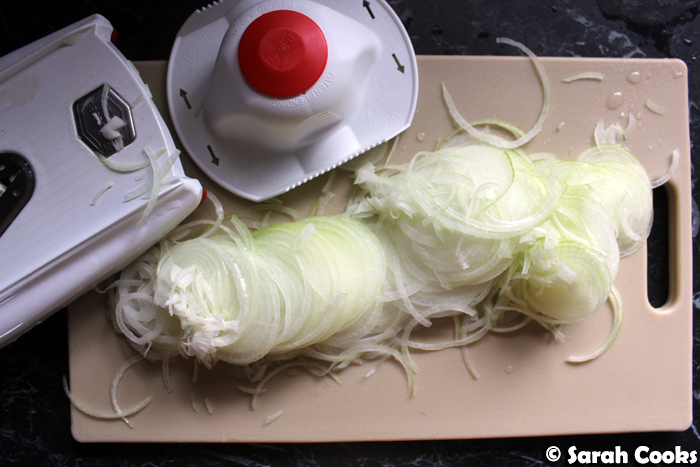 First up, you need to sauté onions! Sandra sliced these really finely, and then cooked them slowly in a lot of butter until melting and golden brown. 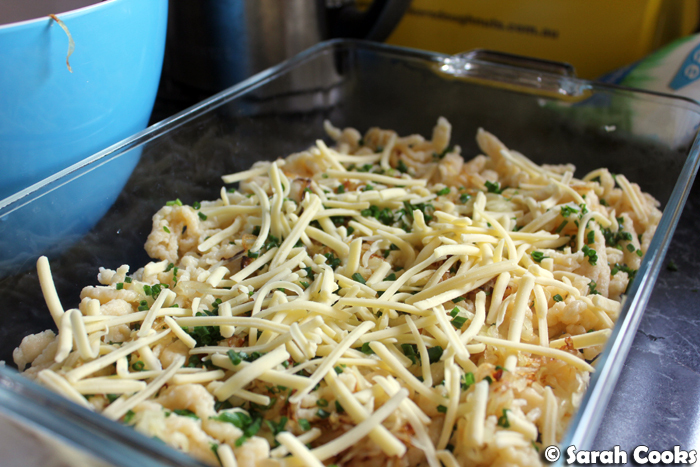 Then you gotta layer the Spätzle with the cooked onions, grated cheese and chives. 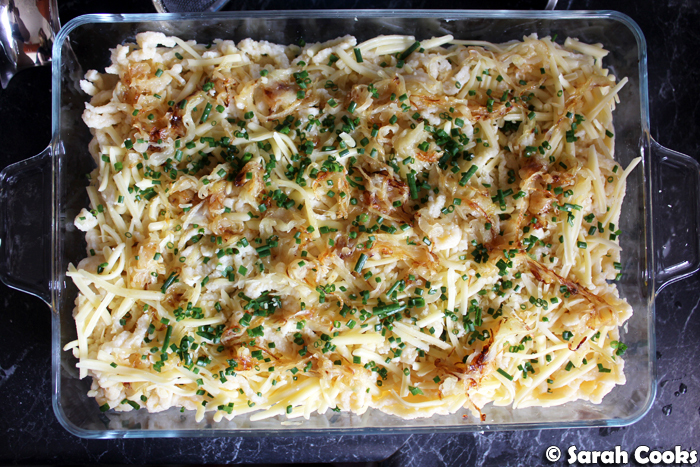 The final step is popping it in a hot oven, until the cheese is melted and the Käsespätzle is hot all the way through. Traditionally you don't cook it until it browns on the top; you just want it to melt until it becomes a creamy, melty, cheesy bowl of comforting deliciousness. An original recipe by Sandra! 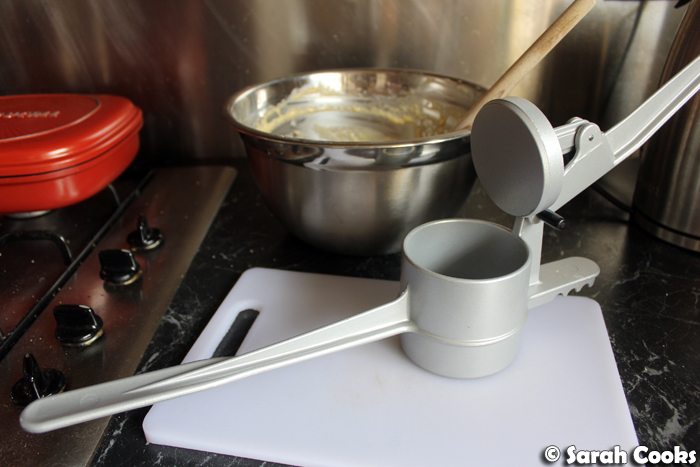 Place the flour, eggs, salt and water (start with 200 mls) in a large mixing bowl and whisk to combine. Add more water if needed, to get a soft dropping consistency. (See pictures above). Allow to sit for 10 minutes. 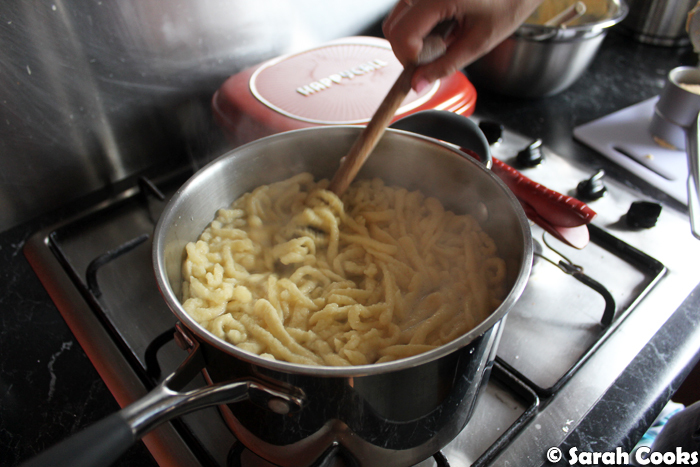 Scoop the cooked Spätzle out with a slotted spoon and refresh in cold water, then drain. 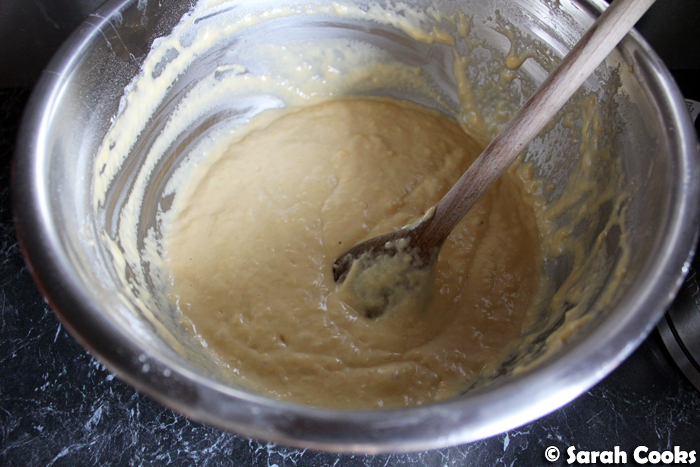 Repeat with the remaining dough until all the dough is used up. Peel and finely slice the onions. Melt the butter in a non-stick pan. 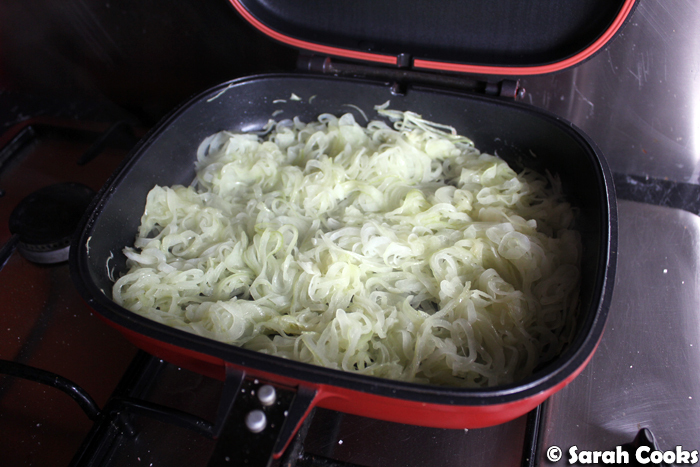 Add the sliced onions, and cook on a medium-low heat until golden brown and really soft. Set aside. 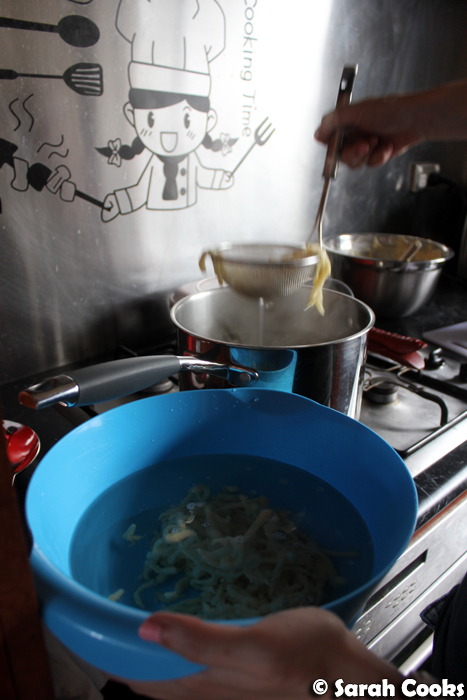 In a large dish (like a lasagne dish), layer the cooked spätzle, cooked onions, cheese and chives. 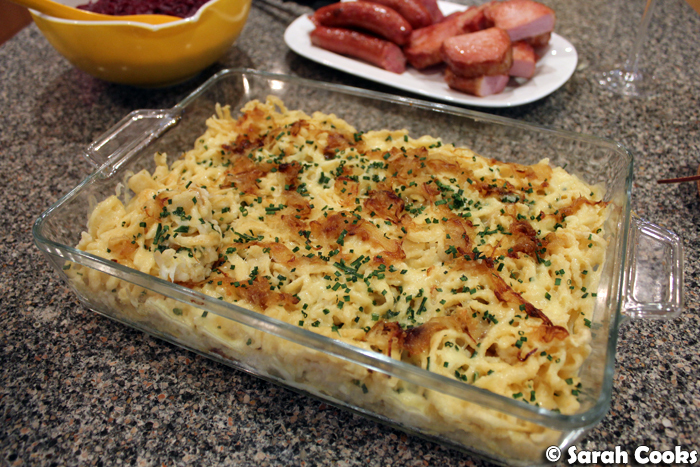 Cook the dish in the oven until the cheese is melted and the Käsespätzle is hot all the way through. Spatzle worms! And everything tastes better with butter and cheese!